The Parliament Member for Sohe, Delilah Gore and his Ijivitari counterpart, David Arore are expected to deliver a petition from relatives of the 13 people killed in a vehicle accident, to the Higaturu Oil Palm company tomorrow. 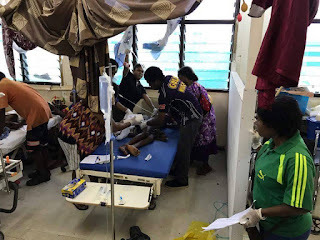 The accident happened when a PMV truck collided with a truck belonging to a contractor to the Higaturu Oil Palm company along the Orokaiva area on Monday. Two children and the District Treasurer for Sohe are among the casualties. Thousands of people had gathered in Popondetta town on Tuesday to present their demands to the leaders. The disaster is the worst motor vehicle accident for Northern province to date. A public "haus krai" has been set in town, and Ms Gore told NBC News, the situation is still tense while other passengers still remain in critical condition. "We put up a haus krai in town and member (David) Arore and I are supporting the haus krai. "There are those still in critical conditions in the hospital, and the situation is still tense, but we are managing it."